I was very pleased to receive a copy of Joe's new book, Craft Beer Revolution Second Edition. Not to be confused with the book by Steve Hindy with the same name. It is awkward to read, and potentially review, a book by someone I see on a semi regular basis. What if you don't like the book? Do you mention any errors or spelling mistakes? Luckily Joe's book if factually accurate, free of grammatical errors and a pleasure to read. I found the tone and personal nature of Joe's writing to be a refreshing change from other beer books. It felt like a pub chat with an old friend. I should say what this book is not. This book is not an in depth tasting guide to the craft beers produced in BC. The tasting notes on the beers mentioned were a little generalized. This is not a beer appreciation book with glassware lesson, beer style guides, food pairings and recipes. This is most evident by the very short Glossary of Terms section near the front of the book. Many terms and beer styles mentioned in the later chapters are not mentioned. There is no definition of bock, weizenbock, porter, mash tun, etc, etc. However, this book is the definitive guide to what is happening in BC craft beer. It covers the past, the present and gives hint into the future of what's brewing in this province. There is brief profile of almost (more on this later) every craft brewery in BC. These profiles are organized by geographical location. Each profile has a brief history about the brewers and owners that are make the beers we love. Joe excels in his book by capturing the passions and dreams of those driving the craft beer movement. I also enjoyed the extra stories placed within the book. There are stories about the Pink Boots, cask festivals, fresh hopped beers and more. Perhaps the big question is should you buy this book. My answer is, "Yes". I learned quite a lot about the new craft breweries in BC. It was nice to know the places and names behind the beers I drink. I binge read this book over the course of two days. If you are looking for a beer appreciation book, perhaps Beerology by Mirella Amato is a better option. I mentioned the "almost" covering every craft brewery in BC. Again this edition omitted the Merecroft Village Pub. This is the only craft brewery north of Nanaimo. I have been to the MVP Pub, I do not plan to return. Their website proudly offers to serve your favourite beer in a frosted mug. Did I mention there was no desire to return to MVP? Something else I liked was the education section. This short chapter gave places to learn more about the appreciation of craft beer, such as the Cicerone program and Prud'homme. Mostly like no one with notice the absence of the beer blogger listings. Well done Joe. I'm looking forward to reading the Third Edition. Maybe I am reading too much into this, but I don't remember hearing about the release of these two beers. Perhaps the need for the press release is dead. Has it been replaced by Facebook, Twitter and Instagram. Will a brewer's social media follower list reach enough beer drinkers that outside help is not needed? What does this mean for blogs/websites that deliver beer drinking news? Perhaps I am thinking too much about this; shut up and review the beers. This first beer had very little to say about it on the Moon Facebook page; "beer named after the View Royal Fire Department and inspired by a collaboration cask of Smoke & Fire. Its a sweet, lightly smoked malt base with just a hint of hop peppers in the boil". So it is sweet Scottish ale with light peppery spice? With most Scottish ales the nose is fairly tame of peaty/smoked malts and caramel sweetness. The Bulldog delivered with a bit of prune richness in the aroma. Without any further surprises, this ale was a balanced mix of mild caramel, peat, dark fruits and dried apricots. 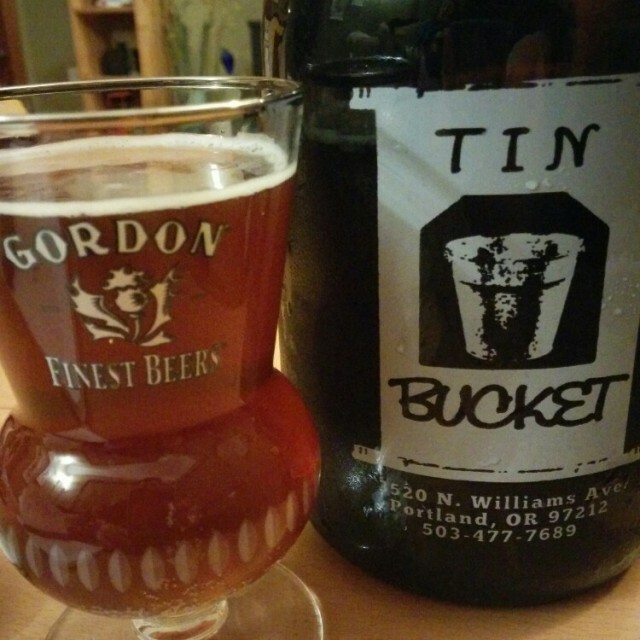 This syrupy sweetness was layered upon an earthy hop bed with a spiciness of unknown origin. It left a chewy residue similar to a Mackintosh Toffee bar that you found in a potted plant. Very nice, I should have brought the bigger growler. Glassware: Definitely a Scottish thistle; preferably cleaner than mine. Food Pairings: Would bridge a dish with roasted or caramelized rich flavours, perhaps a pan seared pork chop with caramelized onions. I was thinking about a BBQ portabello mushroom burger with Branston pickles. The sweetness would calm a spicy dish. How about some flame broiled chicken with fiery Jamaican jerk sauce? This was the real purpose of my visit. There are three little words that makes Mrs. Left4Beer's heart go pitter-patter: Moon sour ale. I was instructed to go to brewery and not to return without a couple of bottles. This beer had an eventful life. It lingered in port barrels, mingled with black currants before getting a dose of Brett then stuck in a corked bottle. The nose eludes to quick tour through sour town. The tour starts at the crossroads of black currant and tart vinegar. Next is a stroll into the land of tannic currants, sweet raspberry vinaigrette with a slight funk cameo. The tannins provide a dry pucker which is enhanced by the slight Brett character. This sensation just keeps going to a dry finish far in the distance. 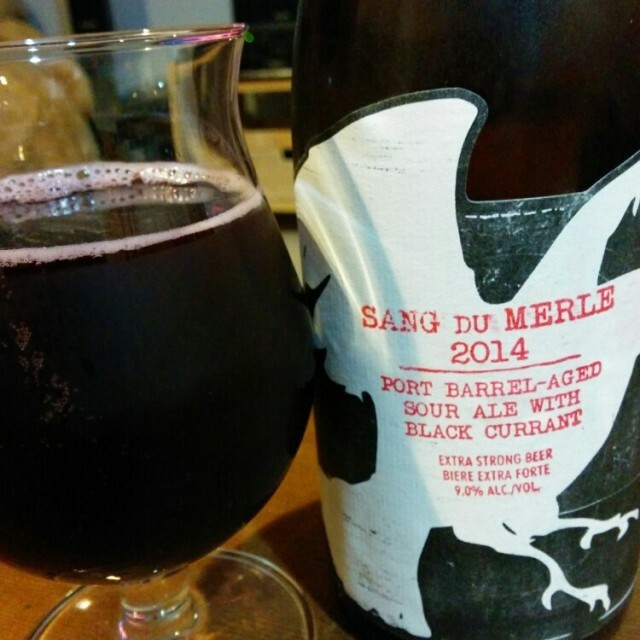 Sour beers never describe well to those who have never tried one. Well done. Glassware: A tulip or snifter would work well to trap the inviting sour and tart fruity aromas. Food Pairings: Nothing, just enjoy. Cellar: With the addition of Brett and complex wood notes, this is certain one to put in cellar for 2 years minimum. I love a good 18D. Perhaps I should explain myself. 18D is the BJCP style guidelines for a Belgian Golden Strong Ale. One might think of these beers as imperial Pilsners fermented with ester producing yeast strains. It is wonderful when a simple brew using mostly pale/Pilsner malts, some simple sugars and noble hops create such a flavourful beverage with deceptive strength. When one things of a 18D, there is only one example: Duvel. The aroma has depth of light fruits, spices and oddly no alcohol. Each sip carries on where the nose left off with an additional effervescence and subtle warmth. 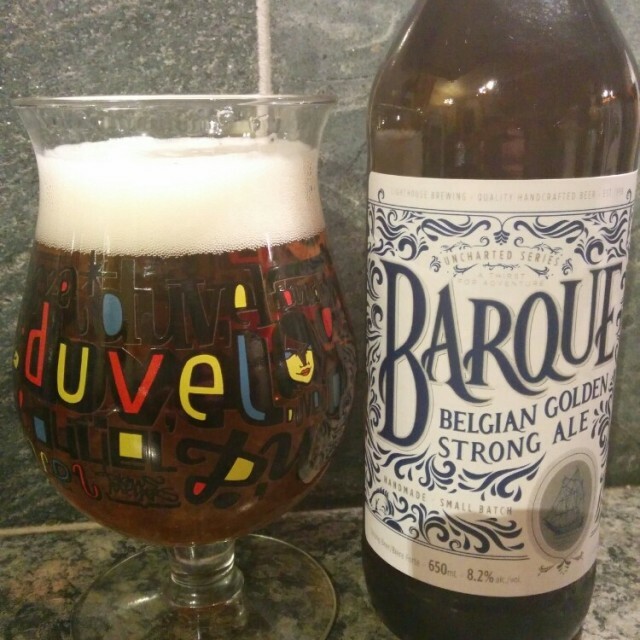 So how did the Barque stand up to this world renowned beer. Everything started from the moment the cap hit the floor. Sadly the initial fruitiness faded to reveal an unassuming nose of moderated spices, dry yeast and mushy bread. Things got real with the sip. It was Duvel, everything was there; the soft chewy bready, the abundance of pears, lemons and apricot baby food. But something else was riding on this creamy, effervescent flavour wave. It must be the south side Wai-iti hops with their lemon and orange zip. Sadly the ending was too clean. Stellar, certainly a contented for Victoria beer of the year. Glassware: Duvel glass. Only a Duvel glass. Most certainly a Duvel art glass. Food Pairings: With spicy and calm sweet flavours, this beer is a must with a spicy pasta dish. I'm thinking about a simple pesto - heavy with garlic - topped with Parmigiano-Reggiano. Thai food is a lime presence would bring out the citrus in the Barque. Try it with dessert of key lime pie. Cellar: Duvel has been known to improve with age. This might just do the same. It is surprisingly well priced for the quality, I plan to put a few down. This is apparently a collaboration between Moon and Spinnakers. I would find out more details, but I don't feel like bothering anyone. 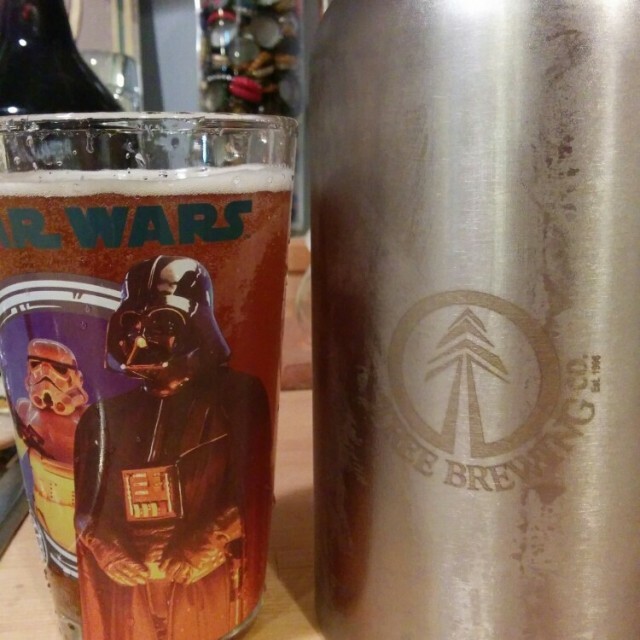 This brew is part of the 'Moon Exploration Program'. Again I would find out more, but again I don't want to bother anyone. It sounds like a plan to get more Untappd check ins trying weird beers. Sounds good. So what is a white stout? It tastes like a stout where you forgot to add your dark malts. What did the beer prick think of the 'unstout' stout? The nose was an odd combination of vanilla latte, coffee grounds and powdered milk. It rather tasted like this too. An peculiar mix of caramel, thin Turkish coffee and vanilla ice cream. Might be best described as a boozy vanilla latte with a sweet powdery aftertaste. It was interesting. In hindsight, I should have filled the small growler. Food Pairings: I can't fathom what to drink with this. Desert might be nice. Try with crème brûlée or rice pudding, the white stout would enhance the sweet, earthy vanilla in these dishes.